Phillies catcher J.T. 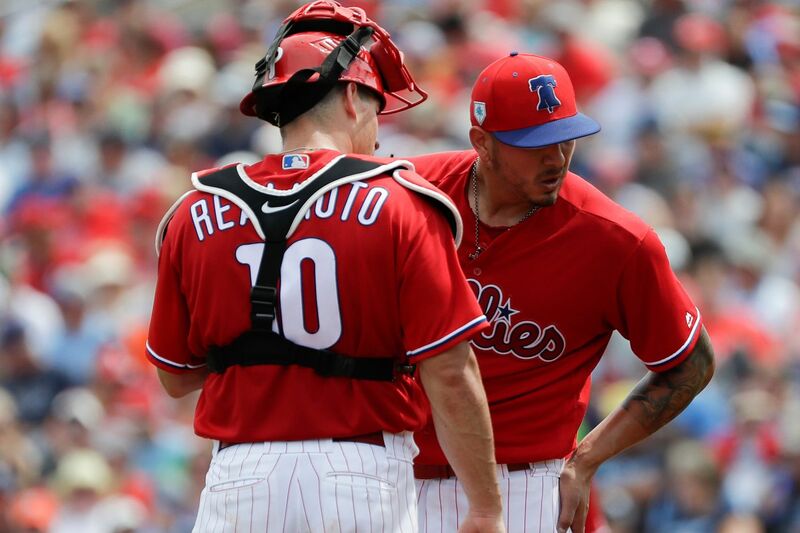 Realmuto meets with pitcher Vince Velasquez during the second-inning against the Tampa Bay Rays in a spring training game on Monday, March 11, 2019 at Spectrum Field in Clearwater, FL. Velasquez gave up four runs in the inning. CLEARWATER, Fla. -- Five batters into Thursday’s game, Vince Velasquez had already given up a long home run, issued a walk, allowed a double, and knocked down a hitter with a high-and-tight fastball. It's still just spring training, of course, but ... yeesh. Velasquez managed to pull it together. Well, sort of. He got into the fourth inning against the Blue Jays before reaching his 74-pitch target. Of the 10 outs he recorded, nine were strikeouts. All in all, it constituted an improvement for a pitcher who allowed six hits and four walks in three innings over his previous two Grapefruit League starts. When the Phillies break camp Monday, Velasquez likely will stay behind to start a minor-league game Tuesday. And, with three days off in the season’s first eight days, they could put him in the bullpen for one turn through the rotation and allow him additional tune-up time. But still, given the heightened expectations for the Phillies in the Bryce Harper era and Velasquez’s unsteady track record over the last three years, it’s worth wondering how long a leash he will get at the back of the rotation. When Velasquez is at his best, according to manager Gabe Kapler, he’s getting hitters to swing over those secondary pitches and under his electric fastball. When he can live down in the zone with his curveball and slider while elevating his heater, he can be effective. "We're really focusing on that curveball below the zone and the fastball at the top carrying through the zone," Kapler said. "Those are the two areas of focus for Vince." Indeed, Velasquez’s mantra is the same as any effective real-estate agent: Location, location, location. His problem, though, has always been his inability to locate those pitches consistently. Phillies pitcher Vince Velasquez throws the baseball against the Tampa Bay Rays in a spring training game on Monday, March 11, 2019 at Spectrum Field in Clearwater, FL. Since the Phillies acquired Velasquez in a December 2015 trade with the Astros for erstwhile closer Ken Giles, they have given him the opportunity to achieve that consistency. It finally seemed to click midway through last season. Over a 15-start span from May 5 through Aug. 3, he posted a 3.12 ERA, held opponents to a .196 average and .616 OPS, and racked up 95 strikeouts in 83 2/3 innings. And when Velasquez faltered down the stretch, like nearly every other Phillies player, it was reasonable to blame fatigue. After all, he surpassed his career high for innings pitched (146 2/3), as good an explanation as any for his 8.45 ERA and .333 opponent average (.958 OPS) over his final nine starts. But the margin for error is slimmer now. Right-hander Drew Anderson, who was optioned to triple-A on Thursday, dazzled in spring training. He was more effective against lefties after replacing his slider with a cutter, a suggestion from pitching coach Chris Young. His profile has risen within the organization, and if the Phillies need a starter, he could be the first call-up from Lehigh Valley. Oh, and Dallas Keuchel is still a free agent. The Phillies have been unwilling to discuss a multiyear deal with the former Cy Young Award-winning lefty, but if the pitching struggles early, it could suddenly become more palatable. But this much is clear: The win-now Phillies need the best-possible version of Velasquez more often this season. If it doesn’t show up, they can’t be shy about looking for alternatives.